Five days into starting my new venture, I thought others starting out might get some energy, inspiration or insights from my journey. Last night I was awarded a Lifetime Achievement Award at the UK Search Awards annual ceremony. This is the first time such an honour has been meeted out in the UK and only Brett Tabke and Bill Hunt have been recognised this way Stateside. Not bad for my first week in a new business! Thank you first and foremost to everyone in the industry that has crossed my path over the last 20 years. That includes all the staff at Receptional over the years, the geniuses at Majestic and the great friends I’ve made at Webmasterworld, Pubcon and BrightonSEO. You all helped me more than you know, and I can’t thank you enough. I disagree. Like baking a cake, starting out in business requires quite a few ingredients to go well. One of them is timing. Another one is a plan. A third is showing up! I knew a year ago that I was retiring from Majestic. In fact we posted the announcement a year ago today. It generated 28 comments on the blog, which were almost entirely complimentary. 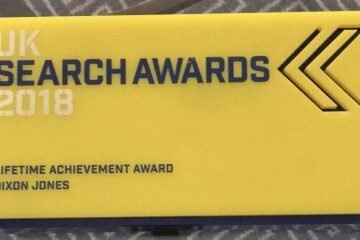 The love I received by friends last year at the Search Awards gave me a clue that launching just before the 2018 awards ceremony would be a pretty good time! I had to juggle my days a little, so I didn’t launch during Thanksgiving in America, but the timing was no coincidence. I didn’t know I’d win this award, but I knew I’d be at the awards. It is the one time in the year where all the influencers gather. It’s a happy time. A great time to make a noise… or start a business. When you start yours, bear in mind that the day you “go live” is really within your control. You don’t have to announce the day you form the limited company… in fact, I had done that from a Vegas hotel room at Pubcon over a month before. I hope more ideas will emerge over the next few weeks on the run up to Christmas. If you want a marketing partner, I encourage you to let me know. In January I’ll want to look at the options I have on the table, because I won’t be able to give them all the attention they probably all deserve. My strategy will be to evaluate them all. Contrast and compare. Not jump at the first opportunity. I have secured office space. I’ll be based at Cranfield University Business Innovation Centre. INCREDIBLY subsidised, making it a offer I couldn’t refuse. I learnt from Majestic that starting your business from a base like a University Innovation hub really sets you up each day for a positive approach to running a business. Just phone your local universities and see what workspace is on offer. I registered for VAT. You don’t need an accountant to do this… just a level head. I haven’t invoiced a penny yet, but I am starting to spend money. If your customer base will be UK businesses, then being VAT registered voluntarily makes sense. Back in 1989 I did this with my first company, Initiative Unlimited. That business probably took 5 years to reach the turnover that LEGALLY would have needed me to register, but my customers expected VAT added to the bills, so registering early simply reduced all my bills for 5 years by the 17.5% VAT as it was then. This time it will be 20%, so it makes even more sense. I bought business cards. Even though they aren’t exactly a world class design, I took advantage of a Black Friday special on VistaPrint and spent £20 (plus VAT… but I’ll reclaim that) on cards that don’t overly clash with the black and white photo feel of this website. They came in useful at the search awards last night – so don’t give up on the the old ways of networking. I went to a Search London networking night. I met up with two old friends in particular who both felt that our futures might cross paths in business. Get out and meet people. My network and my wits are really all I have. If you have other assets, use them, but don’t watch daytime TV! I set up my CRM (Customer Relationship Management system). I am trying out two. It may seem odd that a one man business is using a CRM, but you need some sort of system to give you focus. As the days and weeks pass, opportunities arrive and unless they get written down and considered, then they’ll get lost it time. How many great ideas have we all had in the pub… How few of them went beyond the breakfast table the next day? I had three meetings about a new business of my own. I’ve had a wearable tech business idea for over a year now, but it’s too big to tackle on my own. I spent an hour with a friend I know and trust, to help line up my ducks in a row. The first “duck” turned out to be a technology question, so I sat down with another friend’s son who has a thesis in the subject I needed an answer to. I also had a call with an engineer from my MBA course and she was also very helpful. I think I am closer to answering the technology hurdle, but I now need to talk to a regular sparky and I have a bunch of research papers to read next week. Lastly – make good use of your time. I have been stuck on a stationary train for an hour. WordPress has a useful iPhone App that helps you blog whilst offline.